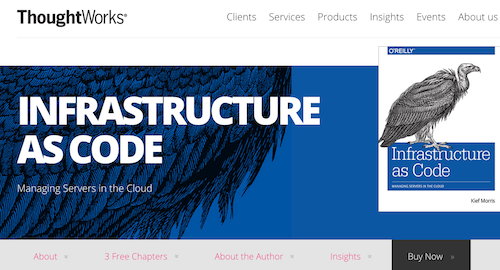 My employer, ThoughtWorks, is sponsoring a free download of three chapters of my upcoming book, ”Infrastructure as Code”. These chapters focus on software engineering, testing, and Continuous Delivery practices for infrastructure. ThoughtWorks has a deep history in all of these areas, so they seemed like an appropriate group of chapters for us to sponsor as a company. I’ve now completed the full draft of the book. We’re getting technical reviews of the book, and have started getting the diagrams professionally designed. It’s awesome to see my crude attempts at diagrams turned into clean, slick images!